Do you need commercial fuel tanks and pumps? If so, the fuel experts at Von Eiff Oil have got you covered. You probably know that setting up a commercial station as part of your operations could save you money and time, but may be unsure exactly how to go about setting things up. 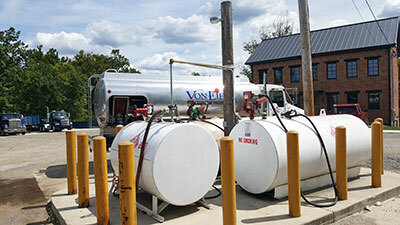 In business since 1944 and a woman-owned business, Von Eiff can answer all of your questions about commercial fuel tanks and pumps and get your station up and running. Von Eiff Oil is dedicated to providing service for companies in a variety of industries. To complement our fleet fueling service, we arrange commercial fuel stations for maximum efficiency. Our stations are designed to get drivers out and back on the road in fast. Why Use a Commercial Fueling Tank for Your Operations? We can install fuel stations with dual pumps so that drivers can fill both fuel tanks at once. This is important because drivers do not have to fill one tank then pull the truck around and fill the other tank, which enables drivers to get fuel in less than half the time. For more than 70 years, Von Eiff Oil has been supplying businesses and homeowners in Carroll County, Frederick County, Montgomery County, Baltimore County and Howard County with quality heating oil, fueling products, tanks and pumps. We look forward to getting your business and earning your trust. For more information about our tanks and pumps, visit our Contact page or call 1-800-VONEIFF (866-3433).